Following the fallout from a much-discussed Super Bowl ad that pitted macro and micro breweries against each other, beer fans are reigniting the question of who actually owns America's popular breweries. Is your favorite brewery a mom-and-pop shop or the satellite of a beverage giant? While it doesn’t necessarily change the quality of the beer in the bottle, it is worth knowing. 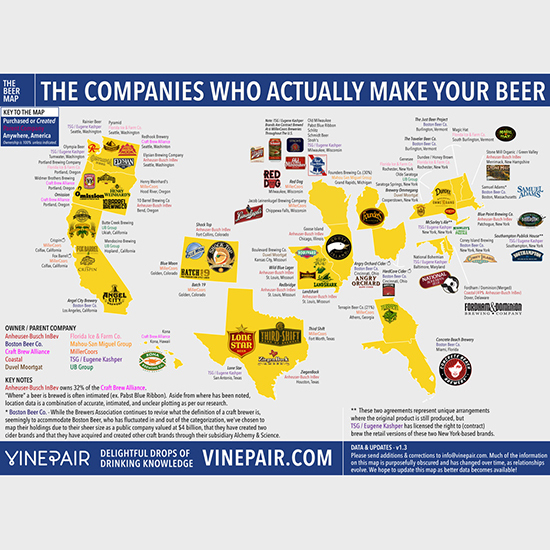 For a better look at the family trees of brews around the country, our friends at VinePair have put together a comprehensive map detailing the holdings of the big beer companies. Some of them might surprise you. For a bigger version, just click on the map below.